Poranguî is a person whose life and work are informed by growing up tri-cultural . 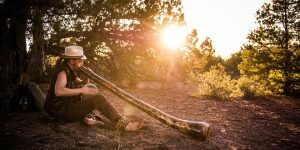 His roots are in Brazil, Mexico and the US and he’s just released a new recording of vibrant “journeying” music Poranguî Live. There is also a counterpart album of the same music with inspired guided imagery and poetry and trance dance guidance by Ashley Klein. Poranguî also practices the healing arts. He combines sound, touch, and awareness, to facilitate emotional and physical healing at the molecular level. Baruch and Poranguî discuss life, music, healing, molecules, and more. • Extra Content: Try This At Home! Music by: Porangui & Zang, and Porangui.